What tools do I use for flower gardening? My rubber handled hand spade. I have had this hand spade for many years. It was purchased at Ace Hardware and is very sturdy. It won't bend like some cheaper ones do. My Fiskars plant shear is used for deadheading and light plant pruning. A very handy little tool. I have a post about deadheading here. My spade shovel and a "turning fork". I dig up perennials with the spade and move them or divide them or both. The turning fork is used mostly in the spring to loosen and turn over the dirt in my garden beds before planting. This is my favorite weeding tool. My pointed hoe. I don't hardly ever have to bend over to weed anymore. I posted about my weeding tool here. My pointed hoe is not available any longer, but similar ones are available on Amazon. I don't have very many garden tools, right? Let's look at the tools that I own "Just for Display" purposes. The Artisan long handled grass clipper I purchased last year for $4. I can see why weedeaters replaced these tedious clippers. I like propping it up along the house somewhere. Fun! I love my sprinklers too. Especially red metal ones! My kids and their friends ran through some of these sprinklers a long time ago. They are a perfect outdoor collection. One of my very favorite vintage garden tools is this wooden rake from an old neighbor. A vintage cultivator and pitchfork are here too. I think this is a vintage potato planter. I have these old tools displayed in a rusty milk can. Rust and weathered wood can be rather appealing! I have quite a few dirt scratchers. I have used these scratchers on occasion. But they are mainly for looks. There's also an old spade and two grass hand clippers in the box. An old rusty seeder sits to the left and watering cans on top of the potting bench. This is a vintage Ro-ho Cultivator. A terra cotta pot fits nicely in the cultivator. Pick up some vintage garden and farm tools to display in your gardens too! I need my new garden tools but I love my old ones! Those are wonderful old tools! The weed clipper looks like a bird leg with a cloven hoof! lol And when I saw the cultivator, I realized that yeah, I have one of those around here - along with an old scythe. Enjoyed your photos very much. Nice display! Oh my friend, I have so many of the same ones. I swear we are kindred spirits! Love the long handled trimmers. I have just one of the hand ones. Rakes, plows, old hand tools, etc. What's not to love? I think I need one of those handy dandy weeding hoes. Carlene, I've lots of old garden tools myself. Something very appealing for me. Fun to see what you have. Thanks for sharing. Love all the watering cans too. I only have a few garden tools...one's I use and a few vintage. Your collection is great! That little pointed hoe for weeds looks just perfect and not bulky and heavy. 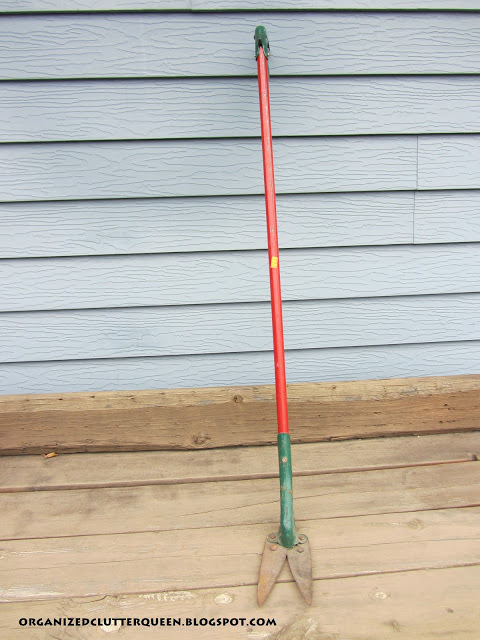 I love vintage yard and garden tool and have a few displayed in the yard. You have a great collection. Well you certainly have a tool for everything! Some of them are pretty cool and some are a little scary looking girl! 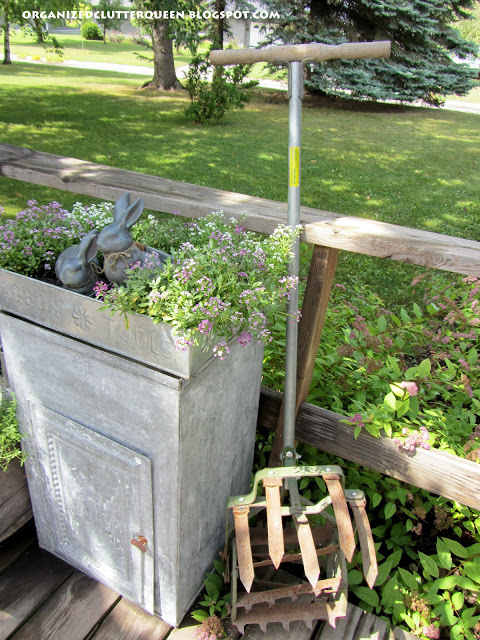 I love how you displayed some of your garden tools in an old milk can. I might have to copy that idea....it's so perfect! Thanks for all the cute pictures. I enjoy your blog!